Census data, housing trends and race/ethnicity. Years after a global crisis, the world’s largest economies are again growing, The New York Times reported over the weekend. Every major economy on earth is expanding at once, a synchronous wave of growth that is creating jobs, lifting fortunes and tempering fears of popular discontent. A tweet on the subject prompted a friend to respond with a question about whether income inequality has grown — and that in turn prompted a quick exploration of data provided by the World Bank. One of its many indicators is the GINI index, which measures income distribution by country and creates a score. A 0 score means absolute equality, and 100 represents absolute inequality. These data, based on country-by-country surveys, are imperfect and incomplete, with most countries missing several years of data. The United States, for example, had only five annual estimates in the last two decades. South Korea, where I live now, had only four. Strangely, a few smaller countries had more complete data. Honduras had all but one year, for example. Given these limits, I focused on the top-25 economies, some of which were missing scores. In these cases, I carried over the most-recent data to maintain a consistent, if imprecise, trend line. It’s Valentine’s Day, a perfect time to note that the marriage rate in the United States has been on a steady decline for decades, save for a brief spike in 2012. Back during the Republican primaries, The Upshot published an interesting short post called the Geography of Trumpism. The reporters back then analyzed hundreds of demographic variables, by county, in an effort to determine which ones might be predictive of electoral support for the eventual GOP nominee. I’ve plotted the percentage of “American” ancestry, by county, on a national map. Keep in mind the data come from a five-year survey by the U.S. Census Bureau, so the accuracy in large counties is relatively safe. Last week I published a new heatmap exploring the popularity of American birthdays. 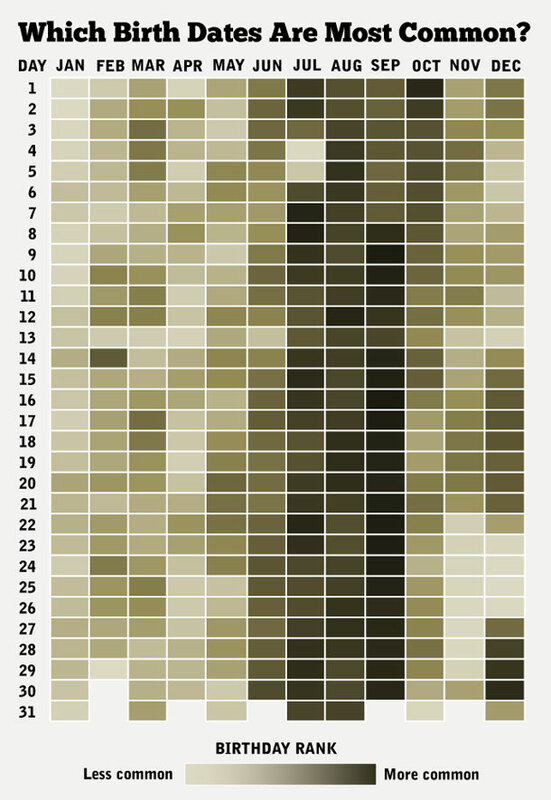 The chart, which uses darker shades to represent higher average birth counts on specific days, can give the impression that some birthdays are much more common than others.